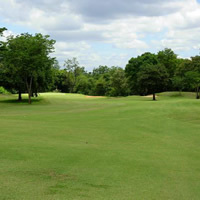 Rooks Korat Country Club and Golf Resort is 15 minutes south of Korat Town and is popular with locals and expats alike. It is a very pretty course and has a modest level of difficulty. The on-site resort seems to of been made with the locals in mind looking to spend just 1 or 2 nights there. The driving range is good but the maintenance is lacking sometimes. The facilities are quiet basic and although the breakfast is acceptable it is not recommended to stay for dinner. The course itself is well maintained, features secluded private grounds and is considered one of the best courses in the Korat Area.